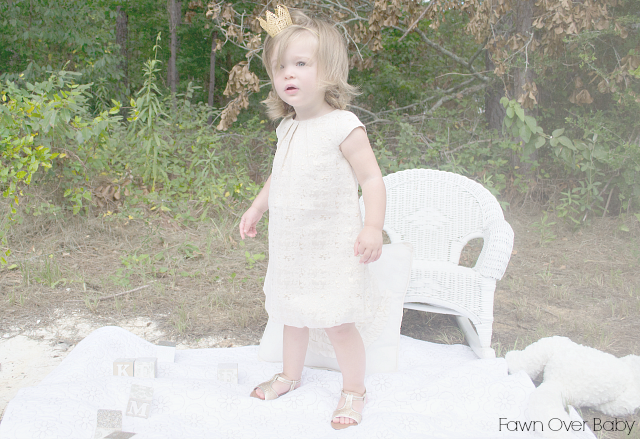 Fawn Over Baby: Sassy Bow Co. 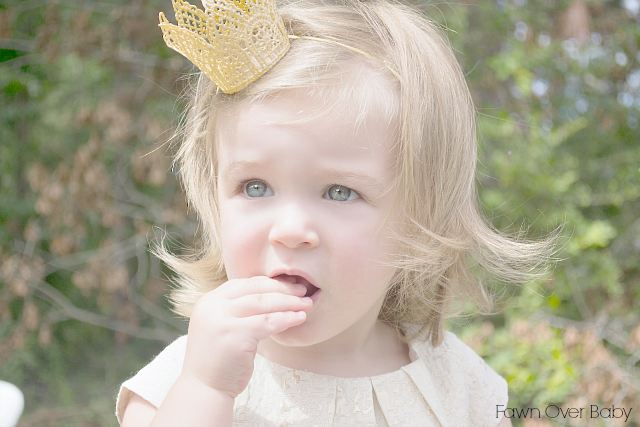 Hair Accessory Review + Giveaway! Happy Monday Friends! I hope you had an eventful weekend! We sure did and I have to say it feels nice to be able to hunker down at the house today. Our funfilled weekend kicked off with an exciting package delivered to our door from the wonderful baby hair accessory shop, Sassy Bow Co! 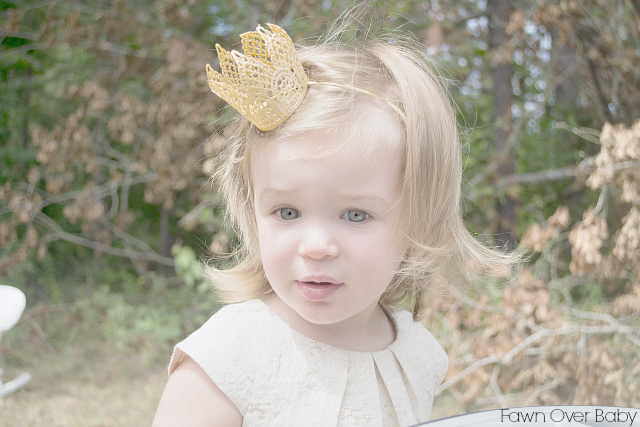 Inside, we received the ULTIMATE hair accessory for any little princess who wants to feel like a queen, the Mini Amelia Lace Crown in gold! 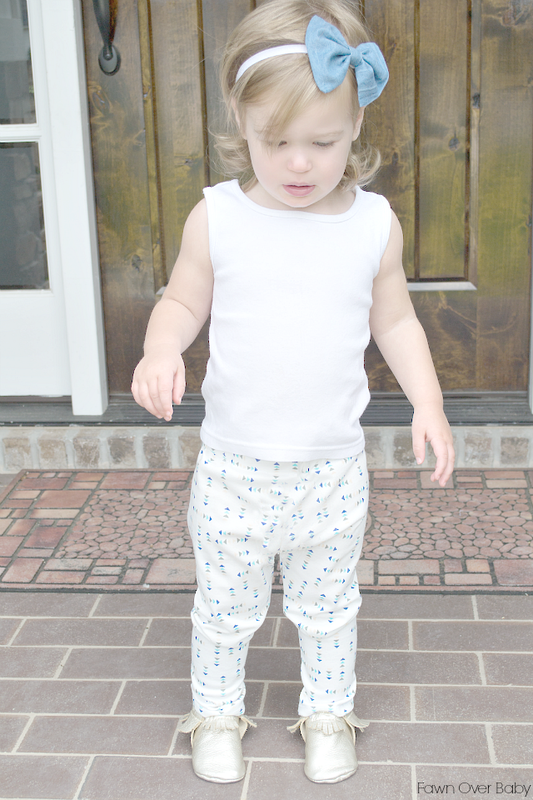 We were also pleasantly surprised to find an extra little delight, the Chambray Denim Bow w/glitter elastic headband! I tried them both on Kenzie to see how they fit and I couldn't have been more pleased. 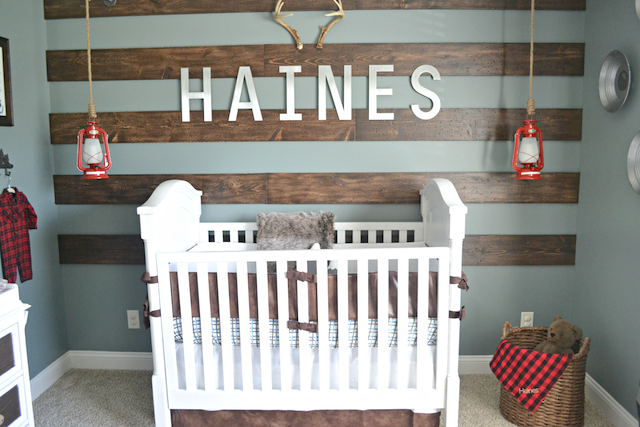 They were the perfect fit, the perfect size, perfectly crafted and the perfect match for little Kenzie. 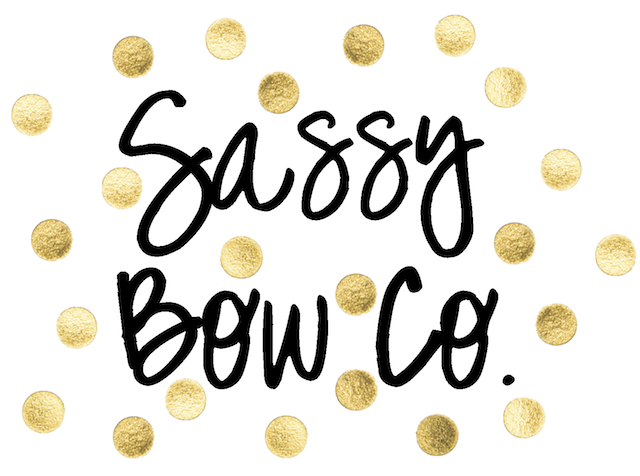 Sassy Bow Co offers quality unique, handmade to order hair accessories for all ages. From Classy and Sassy to Casual and Simple, this online shop is filled with a fantastic assortment of chic hair accessory goodies! 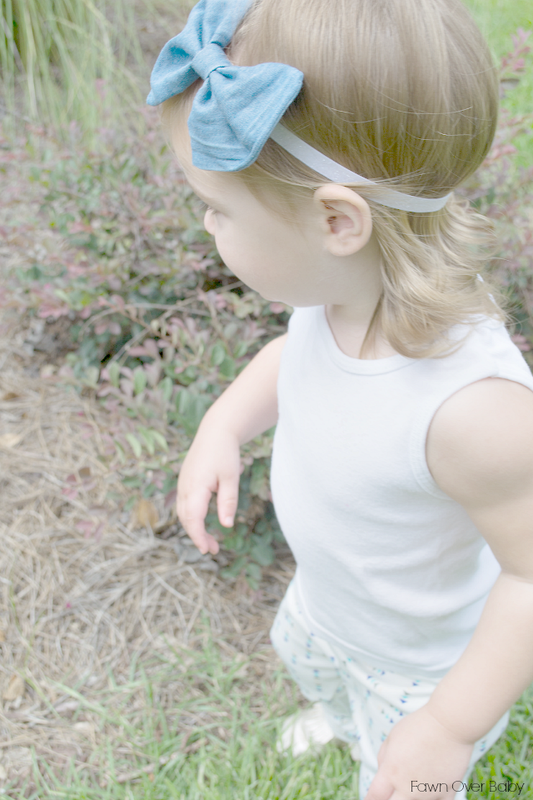 The next day we decided to wear the adorable Chambray Denim Bow with glitter elastic headband. 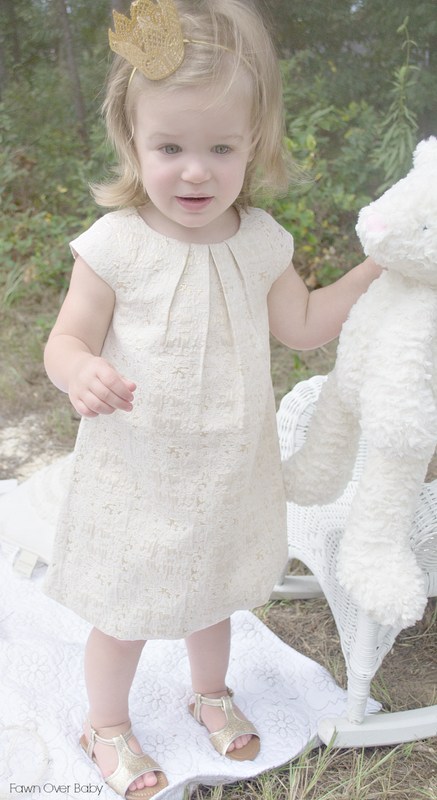 This little cutie was the perfect match for a casual day spent out in the flower garden. The Denim is the epitome of relaxed and casual, however the bow shape and glitter headband gives it a sparkly feminine touch making it the perfect versatile accessory to wear for any occasion. 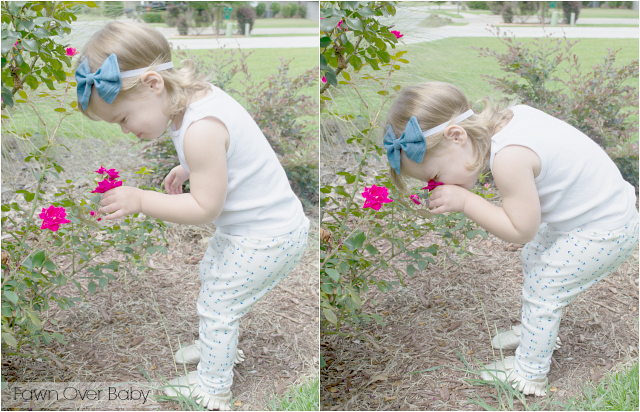 I love the way she smells the flowers. She just can't get close enough, lol! 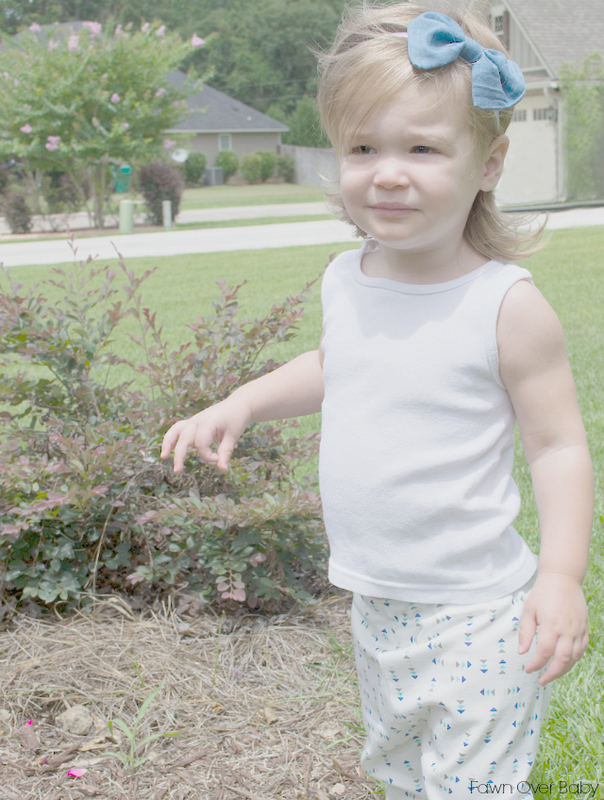 We love our Sassy Bow Co. 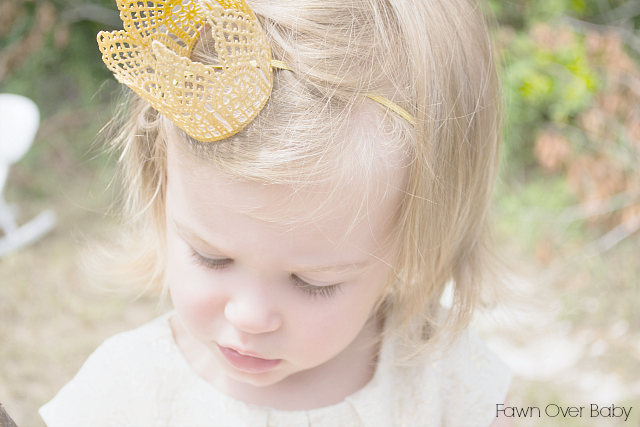 Hair Accessories and we know you will too! 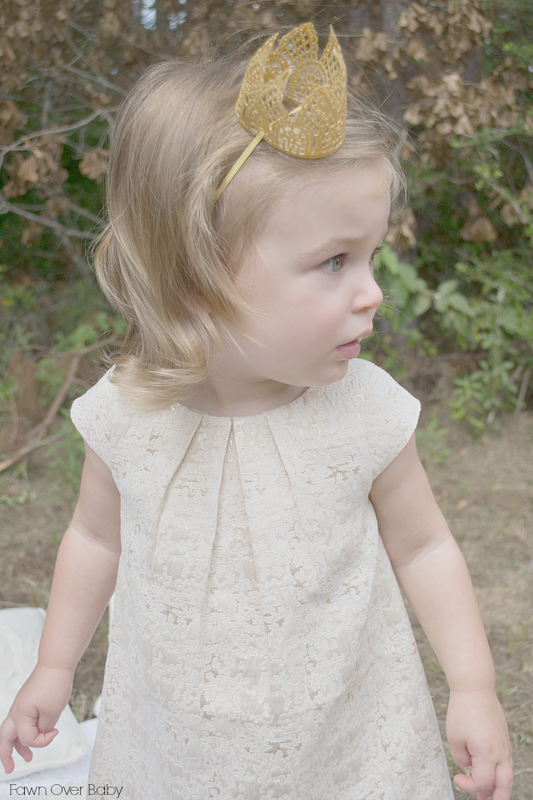 If you are just as smitten over these adorable hair adornments as we are, today is your lucky day! 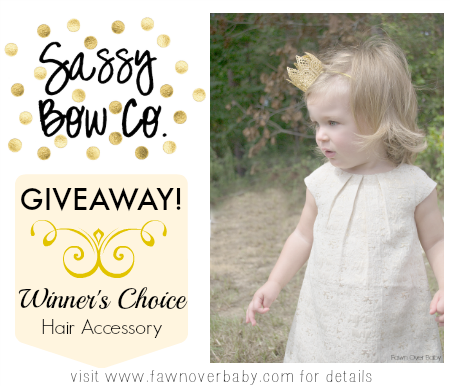 Sassy Bow Co. is offering all Fawn Over Baby readers the chance to win a hair accessory of your choice from their wonderful online shop! All you have to do is Enter our fun GIVEAWAY rafflecopter form below and check back in on Friday to see who the randomly selected winner will be! 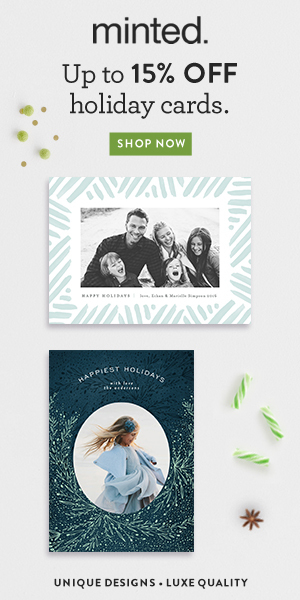 Be Sure To Share With Family & Friends! 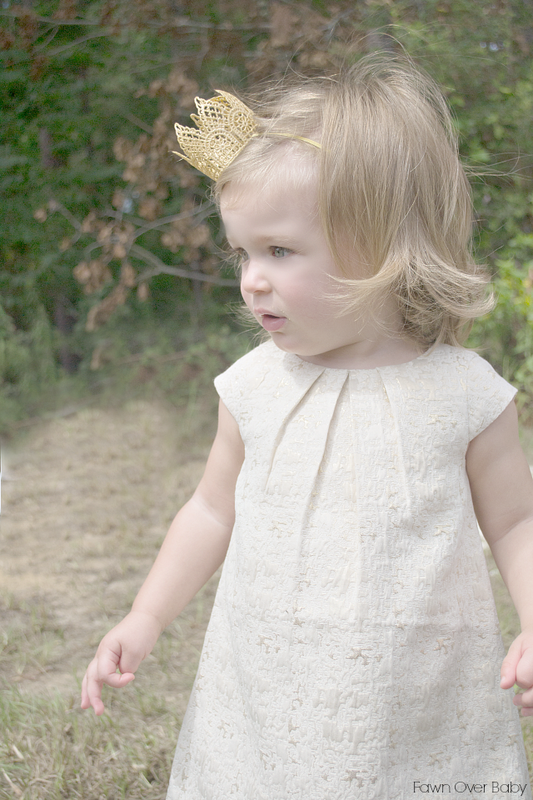 Oh my sweet goodness... LOVE every single one of these... but especially the gold & white ploka dot bow and the gold leaf halo headband!! Such a tough decision because they are all so cute! 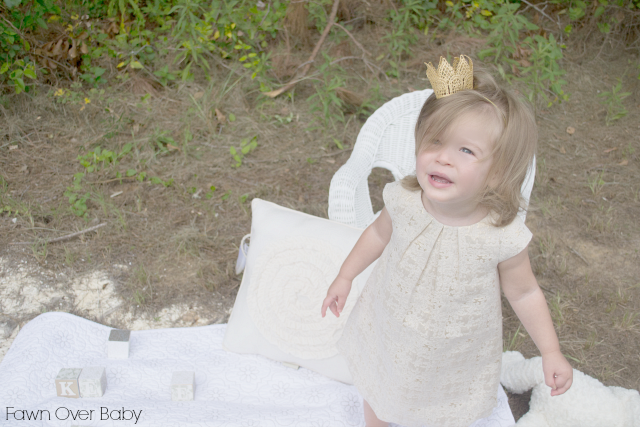 The Peach and Coral Flower or the Gold Leaf Halo are my top choices! You couldn't go wrong! 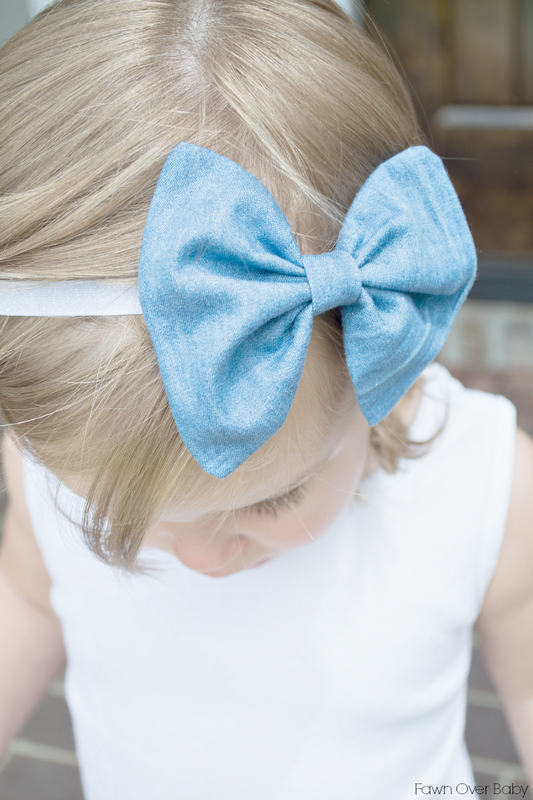 Love the denim bow headband!